Pilates is one of my favorite exercises to maintain and develop physical fitness. I have a pilates DVD that my friend gave to me along time ago, and I love doing that exercise at home. I try to do it at least 3 times a day despite of my hectic schedule. What I like about this exercise is it improves your mental and physical well-being, increases flexibility, and strengthens muscles. My family knows that when it is time for me to exercise, they have to leave the living room or go somewhere else. My son, sometimes, would not leave the room and would also put his shoes on and participate in my exercise. That's funny! Mat exercise is one of my favorite workouts and training. This exercise works all of your abdominal muscles: the six-pack rectus abdominis, which runs down your center; the waist-defining obliques, which wrap around your sides; and the deep transversus abdominis, which is often missed in traditional ab workouts. 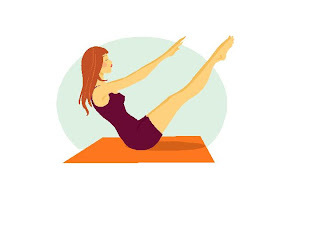 If you are looking for an interesting exercise that you can do at home, Try pilates, it has fewer repetitions of a number of exercises rather than lots of repetitions of only a few. You will surely love it!